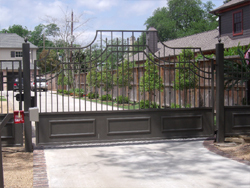 Architectural Fabricators has been providing gate installation, design and repair in Houston for over 20 years. We specialize in automatic driveway gates, wrought iron fences and gate access controls for homes and businesses. With our own fabrication team, we can deliver custom design work on both protective and decorative installations. We also guarantee our labor in writing for a full year, and will perform warranty work on the products we carry for free. 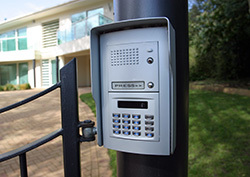 When you want to make a real investment in your property’s safety and security, give us a call. We provide free estimates along with a 100% satisfaction guarantee! We work with homeowners, estate managers, security companies, apartment complexes and business owners. Not only do we craft beautiful metal gate barriers, we use top-quality gate operator systems to put you in control of who comes on and off your land. And we do it with a precision that has garnered us a 100% customer satisfaction rate for over 2 decades. No matter the scale or the complexity, we’ve got you covered! We can install, repair or replace your automatic gate with the latest technology and best-in-class techniques. Is it on a steep slope or very narrow? Our highly skilled technicians will carefully measure your property, discuss your needs and budget with you, and then give you options. We will create a CAD drawing for your approval. When you like what you see, our fabricators will take fine steel that is galvanized inside and out, and then turn it into wrought iron for the best rust resistance. 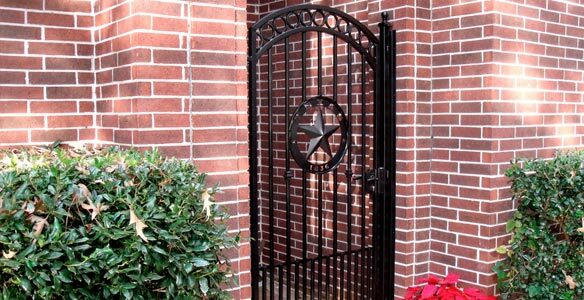 Driveway Gate – Send a message to would-be intruders that entry is by invitation only, yet make an impression with wrought iron fence and masonry work. 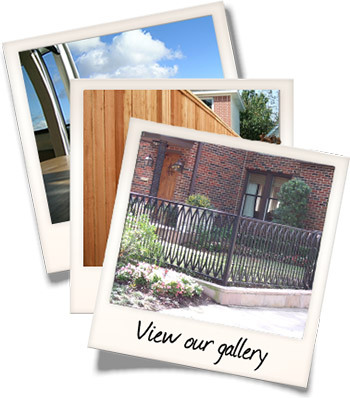 Talk to us about whether a sliding or swing gate would suit your land best. Security Gate – A pedestrian entrance is a must on mission-sensitive business campuses, and homes on more urban or compact spaces. We have a variety of options for access controls. 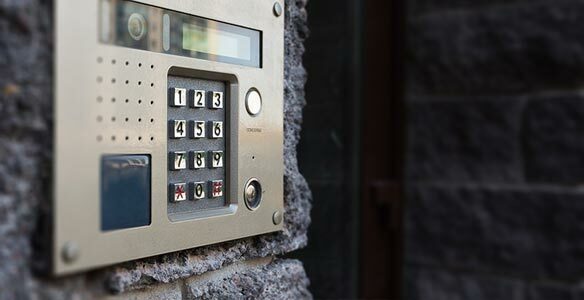 Choose a hard wired or wireless keypad, card readers or phone access. We can create custom gates and fencing that makes an elegant statement about your land. Whether it’s an automatic driveway gate with a matching barrier around the yard, or masonry posts with wrought iron pickets, you have come to the right place. When you work with us, you work with a local team that can do it all: we are highly experienced fabricators, technicians and access control installers. 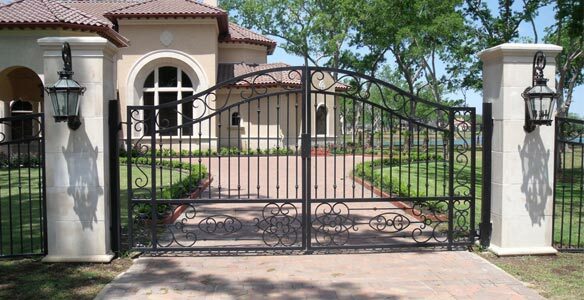 You will find we are gate design service is responsive to your needs, easy to work with and emphasize quality in everything we do. We would be happy to meet with you and look over your ideas, or show you our portfolio and make suggestions that will look just perfect on your property. To enhance your property with custom gate design from our acclaimed team, give us a call today! Battery-operated motors are an economical choice for gates that are located in remote places, such as the back road on large acreage, but they work better as a backup in case of a power outage. Call now for a free estimate on the best access controls in the industry, including BFT brand electronics and Locinox magnetic locks. 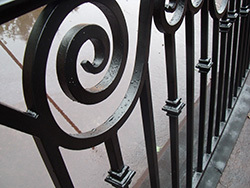 Wrought iron has provided nearly indestructible barriers for millennia. But it also adds a timeless, sophisticated element to your landscaping and interior design. Outside – We can create custom gates and fencing that makes an elegant statement about your land. Our hand forged scroll work is created exactly to your specifications, and can be as basic or as fanciful as you like. Straight or twisted pickets, open baskets, knuckles, flowers, vines and popular Texas star motifs are hand wrought into durable beauty in our own fabrication shop. Inside – Grace your foyer with a grand staircase flanked by sturdy, stair rails and balusters. Add a beautiful balcony, wall hanging or columns. Do you need a spiral staircase? Indoors or out they offer a perfect solution to small spaces or add majestic flair to a plain backdrop. We construct them out of top quality metals, place them in the sturdiest spot, and add all the grace notes you like, from wood hand rails and treads to intricate scroll work patterns. 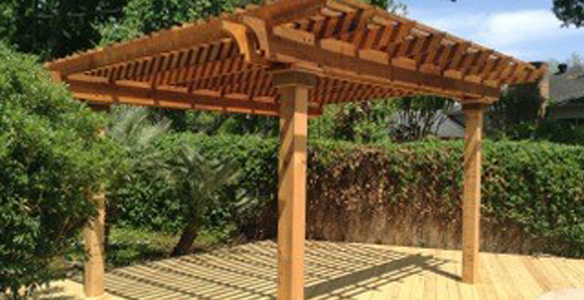 Pergolas – We do decorative cedar pergolas for patios and outdoor sitting areas. Made from rough cut cedar and premium materials that can be stained to protect and maintain beautiful appearance for years. Although most pergolas are for shade, we can put a protective transparent cover on the top that will also keep you dry while letting light in. Decks – We also build custom decks made of treated pine or Ipe. Ipe is a Brazilian hardwood that is extremely dense and long lasting. It is so hard that termites cannot eat it and will last up to 50 yrs. We highly recommend this for decks and custom fences. We believe in priming and painting our metal rather than hassling with the mess and expense of powder coating. We make repainting low-cost and easy. If it chips, it takes just an hour or two to fix. We also believe in driving our gate posts more deeply than most companies – a full five feet. In fact, we have dedicated equipment to do this. This ensures your posts will resist ground movement and shifting soil for decades. We are licensed and insured to $1 million in liability. We understand local building codes and ADA guidelines but what our customers appreciate most is that we work hard to please. You can check it out for yourself in our A+ rating by the Better Business Bureau and our Super Service Award on Angie’s List. That means zero complaints about our work. That’s a record you can trust when planning your fence, gate design or decorative scroll work. 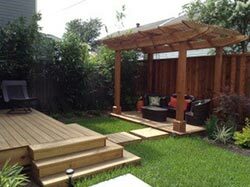 We also install top-quality cedar fences and patio covers, masonry and pier drilling. 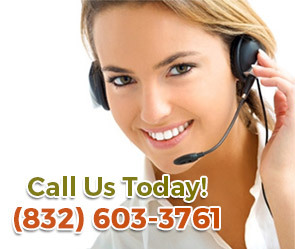 Call now and let’s talk about what we can do to help you beautify your property and make it as safe as possible. 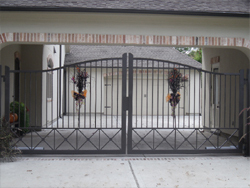 We offer gate installation, design and repair in Houston, Katy, Cypress and nearby areas.